Life’s been funny–sorta. In the meantime, I’ve been keeping myself busy with much needed reading and of course my new favorite hobby after a day of homeschooling and working at home. I mentioned in my previous post that I started a new hobby and that I started doing it because my grandmother passed away almost a year ago. Since her passing, I’ve been taking up knitting and crocheting, almost as in remembrance of her. What started off as a just a thing to try, is really turning into something that I really enjoy! This year, I made a promise to myself that I was going to try knitting projects that I have never done before. 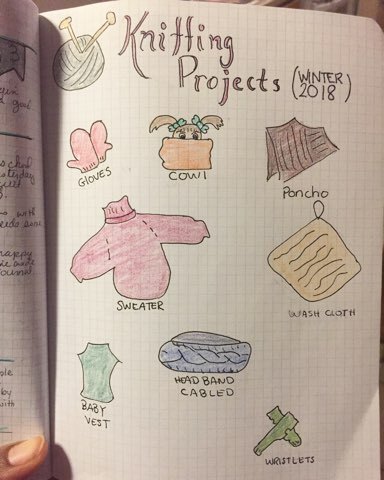 This was my list of knitting projects that I posted to my knitting / crochet instagram account. These are all things that I had never attempted before, but I loved the challenge. Funny though, my first knitting project was a pair of leg warmers for my baby son. 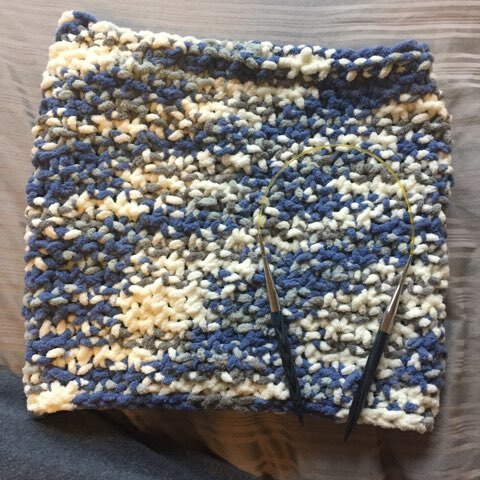 Lately, I’ve created two knit cowls (because one is not enough) and I had extra blanket yarn that I wanted to use up. This was the first one that worked on, since I had enough blanket yarn left for it. Mr. C. gladly took this one off my hands and started using it right away since it’s so easy to just put on, and not have the extra bulk of scarves that could fall over the floor. He really liked this one because it can be pulled all the way up (near the eyes) and still not feel very bulky when he wears it. I thought this was going to be mine, but since he heads out earlier (and more often) than I do, I more than happy to let him have it! 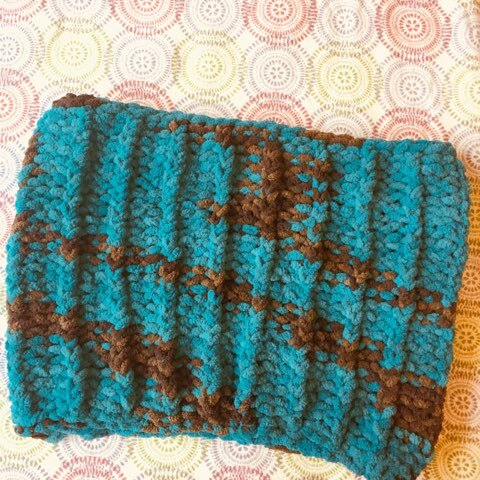 This is the second cowl that I ended up making, it is a 2×1 ribbing pattern. I learned the pattern, then I attempted to make this in the round. This came out alright, and this one was mine just in time for the crazy winter weather we had! It’s lovely, and has an interesting spiral to it (not intentional). Now that my hands are constantly doing something, I have to say that the worrying that I used to do has gone down. I don’t have that much mental time to over think anything, just be concerned about the stitches in my needle. This has been a huge relief to me since now I use now downtime to pray and work. One of my favorite Saints–Saint Benedict (Pray for us! ), talks about this in his Rules. I’ve come to call upon Saint Benedict often to help and pray for me often as I try to foster a place of prayer and work (and plenty of fun) in my home. To say that Idleness is a problem is an understatement. I’ve noticed that in my life (especially with my children) that when they are bored, they can easily get into trouble. Usually, when you ask them why did they do something, they often respond, “I don’t know.” That is usually accompanied with tears and true perplexity on their face. As a parent, we look at them and from our angle, there has to be a reason why they did something, but rationalizing it (according their age), they really don’t know. They honestly don’t know–no clue. If they do have an idea, its usually because they thought it was going to be fun, and found out quickly that it wasn’t fun at all, and they would get into serious trouble for it. So, my children have to pick up a hobby. Something that is their go-to thing to do. They won’t get into trouble doing it, and I don’t have to wonder what they are doing. Of course, they do this when they finish playing. The very interesting thing about taking up a physical hobby in front of the children, is that they want to learn it too. My son started to dive into his puzzles and solving problems more now, and my daughter is learning how to loom. As for me, I’m enjoying making things since it’s fun and I love completing the project, also, my family is benefiting from my hew hobby (win-win). This I don’t mind since it teaches the children how to be productive when they feel they have nothing else to do. There was this old saying that instead of telling your children to do something, show them. I can’t remember exactly, but showing them that there is a time for work, and a time for much needed rest helps them see a balanced life. That leisure is earned, and that sometimes, you just need to take it for your well being. It only becomes disordered when you focus only on leisure, and not work at all. Can’t wait to share with you what I had been working on lately. 1 Comment on "Winter 2018 Knitting Projects"